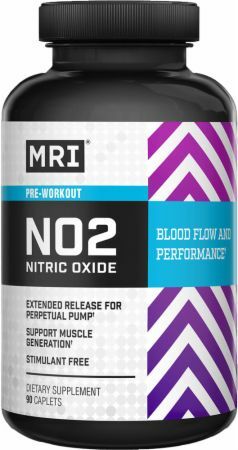 MRI NO2 Nitric Oxide at Bodybuilding.com - Best Prices on NO2 Nitric Oxide! Microcrystalline Cellulose, Stearic Acid, Cellulose Gum, Magnesium Stearate, Hydroxypropyl Cellulose, Crospovidone, Hypromellose, Silicon Dioxide, Triacetin. NO Egg, Fish, Crustacean Shellfish, Tree Nuts, Peanuts, Wheat, Soybeans, Yeast, Artificial Colors or Flavors, Added Sugar or Preservatives. Directions For NO2 Nitric Oxide: Take 3 caplets 30 minutes before working out. Warnings: Consult your healthcare professional prior to use if you have or suspect a medical condition, including high blood pressure and a history of cold sores, are taking prescription drugs. Do not use if you are pregnant or lactating. Not intended for use by individuals under the age of 18 years. Do not exceed the recommended intake. Store in a cool, dry place. Keep out of reach of children.